Nancy Hill (USA-JOR) dancing on a van at an event organized by the local American AFS Chapter, August 1982. Photographer unknown. This image cannot be reproduced outside the guidelines of United States Fair Use (17 U.S.C., Section 107) without advance permission from the AFS Archives. International Education Week (IEW) begins on November 12, 2013. IEW is a joint initiative of the U.S. Department of State and the U.S. Department of Education aimed at celebrating the benefits of international education and cultural exchange worldwide. AFS Intercultural Programs is an educational organization dedicated to providing enriched learning experiences that promote intercultural awareness, tolerance, and communication. As noted in the recently-posted article on the AFS-USA Web site, AFS Participants and Returnees are uniquely qualified to inspire others to pursue international education and cultural exchange during IEW, both in their home and host communities, as a result of their exchange program. Their own inspiration is often a result of the customs, food, traditional clothing, and music experienced in their host communities abroad. The photograph above shows Nancy Hill at a party hosted by the volunteers of her local AFS American chapter shortly after she returned from her summer program in Jordan in 1982. 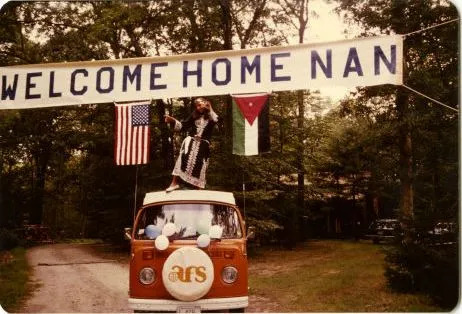 In the image, Nancy is wearing a typical Jordanian dress and she is dancing on a van with the American and Jordanian flags behind her. As this image reminds us, AFS Returnees have inspired others to learn about intercultural understanding in their home communities, by sharing part of the new culture that they encountered during their AFS program.